So why not use the two together and make up a new appetizer that is perfect for game day or any day of the year. The day before you want to make this, place one loaf of the frozen bread loaf in the fridge in a greased bowl or baking pan, big enough to raise the dough in, and cover with plastic wrap. Let defrost overnight. The day you are going to bake, place the covered dough in a warm place and raise for 2 - 3 hours until doubled in size. It will raise faster if you put it in a new room temperature bowl. I placed mine on the stove with the internal temperature of the oven at 200 degrees. On a floured piece of parchment roll the dough into about 18 x 12. 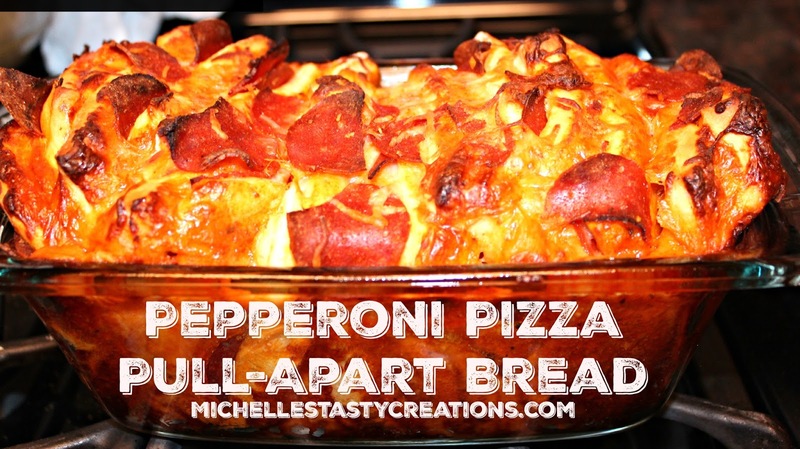 Using as much as you like, pour the pizza sauce on the dough and spread to the edges. Sprinkle with cheese then add the pepperoni. At this point you can add whatever toppings you like. I sprinkled with a little bit of red pepper flakes too. Stack them into sets of three and cut into 4 equal squares. Spray a 9 x 5 glass loaf pan with cooking spray and start stacking the pizza stacks from one end to the other. This is easiest if you are holding the pan straight up on end. Cover and let raise for 30 minutes. Preheat oven to 350 degrees while raising the last time. Bake for 30 minutes or until top looks cooked through. You can add another 10 minutes if needed. The finished bread will be way above the edges of the loaf pan.